imagine I have an architecture as shown. In order to get to the internal web server, should I use a reverse proxy like as shown and redirect traffic to my web server? Is this a more secure way instead of just opening rules at Firewall A and B and let traffic through? And why is it more secure? Do you want a layer of abstraction between your LAN and Web? In terms of additional security, I believe a vulnerable application running anywhere will remain vulnerable, unless you are using WAF (Layer 7 firewall) in between. Web Application Firewalls (WAF) can provide some breathing space till you patch the actual application. Reverse Proxy won't help much in this regard. You can go through below links to find some more inputs. I found many questions are already asked about this. How effective are reverse proxies as a web application security measure? Using a reverse proxy can thwart some exploits targeting the webserver. Reverse proxies are usually simpler than webservers, so they are (in theory!) less likely to have vulnerabilities. Note that this only applies to low-level exploits targeting the webserver directly. Any application-level exploits won't be affected by this at all. The proxy might also directly forward some exploitative connections as they are, so they work even through the proxy. Not the answer you're looking for? Browse other questions tagged firewalls proxy dmz or ask your own question. Reverse proxy or Public load balancer? 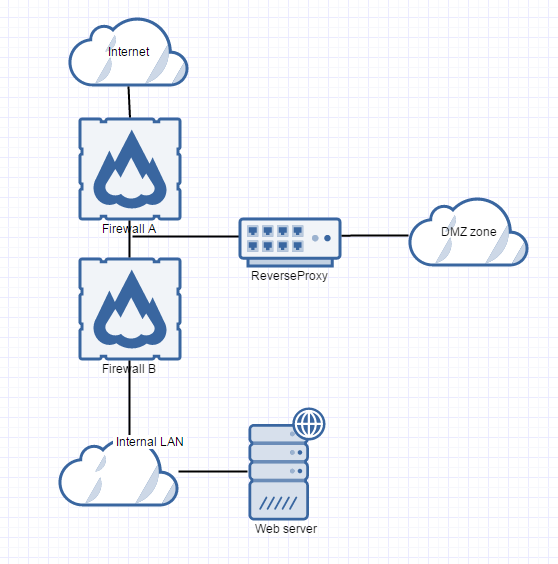 How can I use a proxy appliance as HTTP Proxy & Reverse Proxy at the same time?